Whoa, this is a pretty strong common. Why not "Observer" like it's graphic suggests? This card will be totally unusable if it doesn't. I think this card is rlly good. lookin at how much stuff the warlock has to hurt himself lets see, 2 dread infernals, 2 hellfires, flame imps, life tap, pit lord and all that. 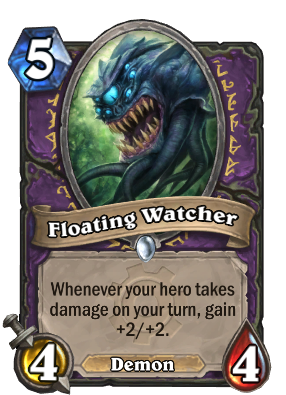 The only problem I can find with this card is that both of the legendaries of warlock don't go together with this card. malganis doesn't work for obvious reasons (immunity) and jaraxxus isn't that good with this card as u are set at 15 max HP. True, but Blood Fury has a good synergy with this. I've been waiting for this card! I love demon combo decks and this one is a perfect addition. Imagine making this one pump up to 8/8 and playing Demonheart in the next round.